↑ "Baseball's 100 Greatest Players". Baseball Almanac. अभिगमन तिथि May 18, 2014. ↑ "ESPN: Top North American Athletes of the Century". ESPN SportsCentury. ESPN.com. September 14, 1999. अभिगमन तिथि February 5, 2013. ↑ "Ruth Bought By New York Americans For $125,000, Highest Price in Baseball Annals". दि न्यू यॉर्क टाइम्स. January 6, 1920. 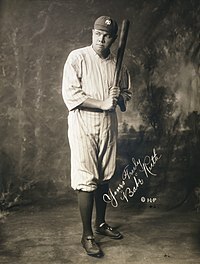 ↑ "Babe Ruth". United States Postal Service. अभिगमन तिथि May 13, 2014.